I recently read about the story of a frustrated Singaporean mom who had to commute daily in the MRT with her 10 month old baby. It was unfortunate that she encountered a nasty elderly passenger who lashed out at her for taking up space in the carriage with her pram and for “blocking” the way and it probably brought back memories of other unpleasant incidents that happened earlier when she was pregnant. While I have no doubt that these incidents are absolutely probable, but is the situation really this bleak in Singapore? We do not always get a seat, but we are happy together! As a father of 4 kiddos who doesn’t own a car and relies exclusively on public transport, we take the bus and MRT wherever we go, with only the occasional taxi when we are running late or are simply too tired. 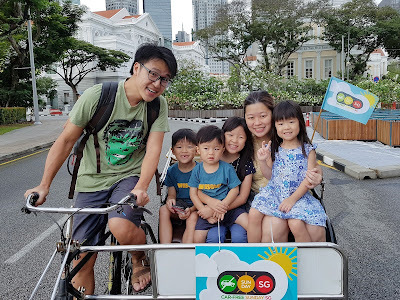 So I can safely say that I do have the experience of commuting with young children aged 2, 4, 6 and 8 either alone, or with my missus and so far it has always been a smooth ride (except when the MRT breaks down). In fact, I am often pleasantly surprised by the kind acts of fellow commuters at times, like my previous encounter with an auntie on board the bus which I blogged about years back. But sometimes we do, and commuters will try to give up their seats so that the family can sit together. Maybe they paiseh also, but we are always thankful and the kiddos will always thank them! 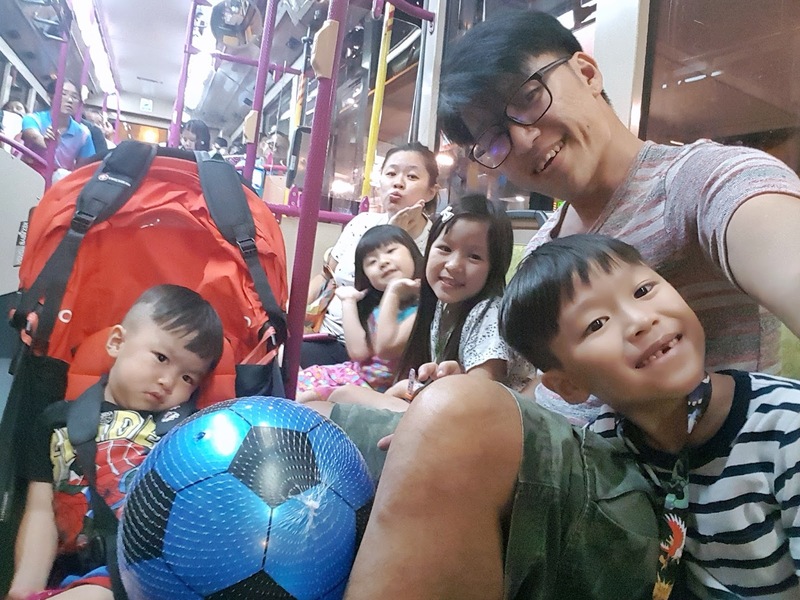 Even now when I get into the MRT carriages with the kiddos, I have had fellow commuters coming from afar to offer seats for the little ones. In fact, most of the times I am the one feeling bad especially when the kiddos decided to reject their offers because their idea of a fun ride involved doing some pole dancing. And when they do take up the kind offers, I always make sure that they appreciate and offer their thanks, sincerely! I will be lying if I said that seats are offered every time, but even when they are not, the kiddos also understand that they are able-bodied and it is definitely not their entitlement. I do remember that my wife was usually being offered seats too when she was pregnant back then. 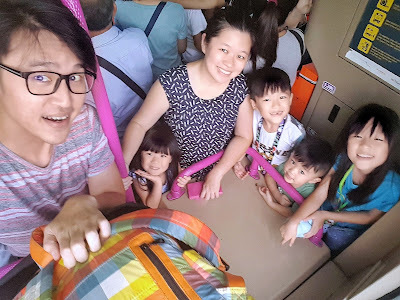 Nevertheless I have to admit that getting around via MRT is a little trickier with a pram during peak hours, because for some weird reasons, MRT commuters fear moving in to the center of the train carriages. But as long as I verbalize to others on the need for me to move in with my pram, I usually have no further issues. Commuters are sometimes too engrossed with their handheld screens to notice and it sure doesn’t help for one to rely on telepathy for needs to be met. In any case, MRT doors closes fast these days, one really have to be alert when getting in or off the train. I empathize with the mom on meeting the “crazy” lady whom I would almost be certain I would be giving a piece of my mind to if I were her. And I do recall that I did that once to an elderly lady who used vulgarities on me on the bus, but only to realize much later that she probably had some mental issues because she was doing the same thing to other passengers when I met her again a couple more times on different occasions. No point getting angry over this right? If all else fail, maybe a trishaw for the family? I am of the opinion that the ease of getting around Singapore with infants and young kids via public transport is still great. Unfortunate incidents do happen on and off, and everywhere as well, so I do hope the mom feels better now after writing down her thoughts. There are all sorts of people out there and while we cannot change how others behave, as parents we have the responsibility, and we definitely can help shape the way our future generations conduct themselves. Whenever things do not go their way, stop, take a step back and relax. It doesn’t always happen that way and there are surely more pleasant occasions! No one can make you unhappy, except yourself. Do not be afraid to ask for assistance if necessary, and always remember to offer theirs if the situation calls for it. Do not be disappointed with rejections, you can never really know the reasons behind them. Besides, no one owes anyone a living, so be gracious. Hopefully with the above, my kiddos can be stronger, more self-reliant and empathetic and not grow up to be self-centered and self-entitled little monsters!